Your character, more than anything else, will impact how much you accomplish in this life. It is more important than your talent, your education, your background, or your network of friends. It’s critical for healthy friendships, family and church. It deeply affects the quality of our relationship with God. In fact, the shaping of our character into that of Jesus is one of God’s primary activities in our lives. 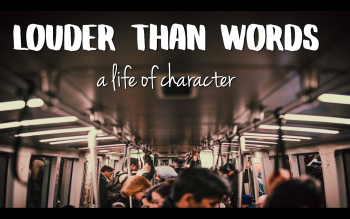 Throughout this new teaching series, Louder Than Words, we’ll explore a definition and understanding of character, as well as look at the effect of character (and a lack of character) on our relationships with God, ourselves, others and the community. Services are on Sundays at 11 a.m. ET, at 4862 Broadway. Hope to see you there!